Lenovo's flagship 2-in-1 laptop slims down while gaining an inch of screen real-estate, but not all is perfect about this most impressive model update. After sticking with the same design for two years, Lenovo is giving the Yoga 900 a dramatic makeover – so much so that it's fair to say the Yoga 910 is completely different 2-in-1 laptop. 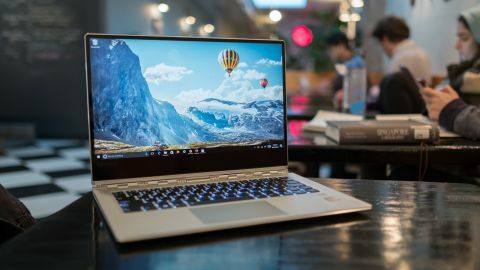 Lenovo has tweaked or completely changed every element of its flagship convertible with a slimmer chassis, larger 13.9-inch UHD screen, smaller bezels, revamped keyboard layout and Intel’s latest 7th generation processors. However, all these little improvements have made the Lenovo Yoga 910 a slightly more expensive device, starting at $1,049 (£1,299, AU$1,999). Aside from the higher price tag, a few new longevity and comfort issues prevent it from being the best hybrid machine on the market. With that starting price, the Yoga 910 isn’t the world’s most affordable flagship 2-in-1. However, for this premium, you get a loaded starting configuration with a 1080p touchscreen, a speedy Intel Core i7-7500U processor, a respectable 8GB of memory and a 256GB SSD. For a slightly pricier $1,159 (£1,399, AU$2,499), the 13-inch HP Spectre x360 convertible offers twice as much storage. Alternatively, the Samsung Notebook 7 Spin is outfitted with discrete Nvidia GeForce GT 940MX graphics and 16GB of RAM for $1,199 (or £899 in the UK minus 4GB of RAM and flash storage). It’s arguably the most powerful machine in this lot, thanks to its dedicated graphics chip, but you’ll too be limited to a 1080p screen and a last-generation Intel Core i7 processor. Though, the combo of a 128GB SSD and a 1TB HDD is tough to ignore. Our review configuration bumps things up quite a bit with more storage and memory, but it will cost you more dough at $1,349 (£1,749, AU$2,799). HP recently introduced a new 4K Spectre x360 at a kingly sum of $1,599 (about £1,290, AU$2,090). The Lenovo Yoga 910 is among the thinnest convertible laptops in the world, measuring in at just 0.56 inches (1.43cm). The 0.54-inch thick HP Spectre x360 just manages to edge it out by a few hundredths of an inch. Compared to the last-generation Yoga 900, the Yoga 910 is only a sliver thinner by 0.03 inches (0.01cm). Lenovo’s latest flagship convertible is also 0.2 pounds heavier than last year’s model, and this is due to its denser 79 Watt-hour battery and 0.6-inch larger display. While it isn’t that much thinner, this new hybrid has a new sleeker and sharper styling rather than the slightly curvy frame of yesteryear. The Lenovo Yoga 910 exudes a starkly modern design with straight lines forming sharp angles, including places you wouldn't expect such embellishment. For example, the top and bottom half of the notebook meet to a slightly indented V-shape, aligning into a more prominent gap near the watchband hinge. The modern touches are a welcome change after seeing practically the same design for the last two years, though it also feels as if Lenovo went too far in certain respects. As with all other Ultrabooks of this generation, the Yoga 910 adopts USB-C for charging, video out and fast data transfers. However, it hasn’t subbed out every USB-A port, leaving one to connect your legacy peripherals. A newly-added fingerprint reader also makes its way onto the keyboard deck, and we love using it to sign in via Windows Hello with a single tap. The Dell XPS 13 and XPS 15 blew us away by packing larger screens into smaller chassis, and now Lenovo captures the same magic with the Yoga 910. The display panel size has been bumped up from 13.3-inches to 13.9-inches without drastically increasing the size of the frame. In fact, this laptop features some of the thinnest bezels we've ever seen on a Lenovo device, save for an unsurprisingly fat bottom lip. This is thanks to Lenovo slimming down the bezels along the top and sides while moving the webcam to the sizable chin beneath the screen. It effectively apes Dell’s InfinityEdge screen; the only discernible difference being that Lenovo has smartly placed the webcam in the center of the screen rather than off to the left. Aside from simply being a physically bigger screen, this is the first Yoga laptop to feature a 4K display. It’s a flat screen real estate upgrade that’s roomier for multiple open windows. It’s also just big enough for watching movies with a friend, and the down-firing JBL speakers offer some surprisingly nuanced sound – so long as you’re not muffling the audio with your lap. Unfortunately, the display is not completely perfect. The screen is a bit dim, and you’ll need to set the screen brightness at 70% or higher to see it clearly in the sun, which is a huge drain on battery life. Aside from that, there’s plenty to appreciate about the Lenovo Yoga 910 bigger, sharper, and more contrast-rich display.